Home » Glasses & Contacts » Eyeglasses and Designer Frames » Sunglasses » Should my kids be wearing sunglasses? After a child reaches their late teens, the lens of the eye changes and becomes a natural UV/blue light absorber to protect the back of the eye (retina). Before a child reaches their late teens, the lens allows UV/blue light to entirely reach the back of the eye (retina) and can create harmful conditions to develop in the future. As adults after age 20 years, we must continue to protect our eyes with proper sunglasses as well. The lens of the eye will continue to absorb UV and blue light at the risk of developing cataracts and the retina becomes more at risk to developing macular degeneration. That is why it is critical for young children to wear sunglasses because we get 80% of our harmful UV/blue light exposure before age 20 years. Also, please note that if you wear very dark sunglasses that does not truly filter out UVa, UVb, and blue light, you could be creating more harm to your eye. A very dark sunglass will block out bright light, but without the proper filters in the sunglass lens, your pupils will open larger allowing more of the dangerous UVa, UVb and blue light into your eyes despite the greater comfort of less bright light. That is why I caution our patients about the “swap meet specials” that seem to be more of a fashion sunglass rather than a truly protective sunglass. 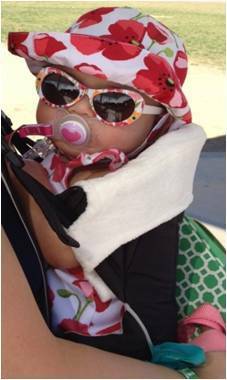 Picture of my 5-month old granddaughter wearing UV/blue light filtering sunglasses!